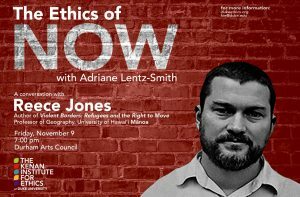 Reece Jones is the author of “Violent Borders: Refugees and the Right to Move”. Dr. Jones is also a Professor of Geography at the University of Hawai’i at Manoa. Dr. Jones’ conversation is part of the Roots and Routes Series, a new series focused on new ways of seeing and understanding human migrancy. Learn more about the Roots and Routes Speaker Series here.